Aside from the ads like this one that ran in early 1993, the Teleplay System never saw the light of day by the time Christmas rolled around. Connecting people to each other, especially when it came to games, seems like a no brainer today. 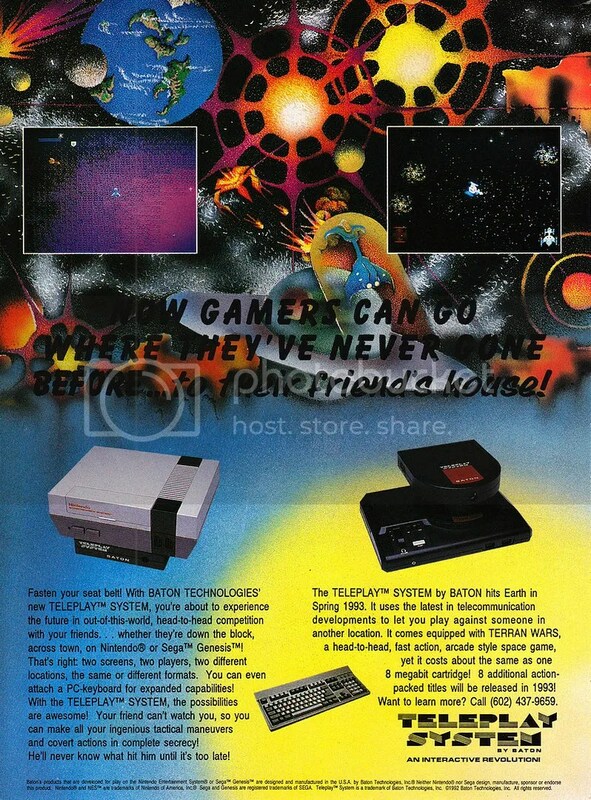 But back in the 80s and early 90s, it was viewed as something akin to bleeding edge voodoo. Modems have had a long history — much longer than I thought they did going back to the 1950’s when AT&T developed what Infoworld calls “the first commercial, mass-produced computer modem then called a ‘digital subset'”. It was pretty big. 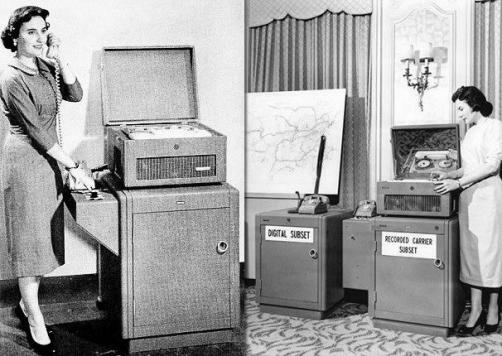 This was AT&T’s modem (photo courtesy of Infoworld) from 1958. Fortunately the tech shrunk down to something smaller than an office desk. As the technology improved (and became a lot more user friendly), modems eventually opened the doors to BBSes (bulletin board systems) in the 80s connecting users around the world (or safely in your local area code if there was a friendly BBS there to help avoid long distance charges) to chat, share files, or even play games at blistering speeds such as 300 bits (that’s right, BITS) a second. And if there was only line in the house, you had better hope no one else picked it up to make a call if you were in the middle of downloading that 10k file. Fortunately, modems DID get a lot faster. By 1993, PC users already had several flavors of multiplayer in the form of MUDs (multi-user dungeons that were text-based and ran on networks such as those at universities, colleges, or even research facilities) or pay-by-the-minute MUDs such as GemStone II and III on GEnie (General Electric Network for Information Exchange). That year also saw the arrival of Doom from id Software, a seminal title that revolutionized an industry and also provided co-op and deathmatch play over a network. Consoles also wanted to get in on the same possibilities. Nintendo’s Hiroshi Yamauchi, in particular, wanted to position the Nintendo Famicom (which eventually made it over to the US as the Nintendo Entertainment System) as a sort of “trojan horse” in people’s homes. On the outside, it was a great game console. But with the expansion port built into it, he hoped to turn it into a cheap PC that would eventually enable users to do things such as trade stocks, keep up with the news, and connect with others via modem. That didn’t really take off in Japan (and was pretty much unknown in the US), but the torch carried by the concept was handed off to a number of other pioneers that wanted the same thing. That would culminate with the Teleplay System by Baton whose short history Frank Cifaldi over at Lost Levels recounts with its inventor, Keith Rupp. The road started off with an idea in 1990, two years after the Japan-only debut of the Famicom Modem, and later led to a meeting with Atari’s famous founder, Nolan Bushnell, who jumped at the idea and helped roll out the first version called the “Ayota View”. Unfortunately, to cut costs, the modem’s speed was cut down to 300 bps which was just horrendously slow for the kind of gaming it was envisioned for. Sega also had its Meganet service which ran only in Japan (it started in 1990) and Brazil (when it came there in 1995) offering dial-up access with downloadable games and had even offered services such as banking. Unfortunately, logistics and the Genesis/Mega Drive’s poor performance in Japan all but made it a relatively short lived experiment. But it was still proof positive that the console kingpins were feeling out the young online market that services such as GEnie, Compuserve, and AOL were paving the way for. Eventually, Bushnell left the partnership leaving Keith holding the bag, but that wasn’t the end of the Teleplay story. Keith eventually developed a 2400 bps prototype in 1992 with an option for a keyboard attachment and could also be used for either the NES or the Sega Genesis. Not only that, but Teleplay friendly games like BattleStorm were cross-platform friendly: NES and Genesis players could compete with each other in the same game. To give you an idea of how huge that idea still is, consoles today can’t even do that, or are restricted from doing so, by whatever lines in the sand (technological or political) drawn by Sony, Nintendo, or Microsoft. Outside of small experiments such as 2007’s Shadowrun which allowed Xbox 360 and PC players to compete with one another, cross-platform play is still something of a dream feature for many gamers. Baton Technologies was formed around the Teleplay whose offices Keith reportedly, and literally, lived out of from while he and his team worked on the technology while trying to field additional venture capital. However, one major hurdle still stood in the Teleplay’s way — an actual license. Just as with the games, unless it was graced by a license from Nintendo or Sega, retailers would refuse to carry it for fear of souring their relationship with either company. The lack of having one also had a trickle-down effect to Baton’s efforts to court software makers who had an interest. Remember, this was the early 90s — heavy hitters like Nintendo and Sega firmly held the keys to the multi-billion dollar kingdom they split between each other and if retailers wanted a piece of that pie, they often chose to play by their rules. The Teleplay was on the verge of manufacturing — it was literally ready to go, had three games specifically made for it (Battlestorm, Terran Wars, and Sea Battle), and just needed a manufacturing order — but without the licensing and additional capital from his investors worried about betting against AT&T, Keith’s hopes for the company folded when it shuttered later in 1993. The ad above was taken out in January that year showing just how close the device was to becoming a reality and how quickly deals can come apart at the last minute. Surprisingly, the Edge 16 also never made it out to manufacturing either despite featuring in an article by Businessweek such as this one from 1994. It, like Teleplay, promised a glorious future on the Sega Genesis with Skype-like conversations, streaming data from cartridges and CDs, and talks with Microsoft, all of which quietly died when the Edge 16 never made it out. However, Sega’s online ambitions were still carried aloft via cable with the Sega Channel which kicked off in 1993 and ended in 1998 and didn’t quite become the breakout service that it was hoped to be coming out at the tail end of the Genesis’ life cycle and the start of the Sega Saturn’s (’94 in Japan, ’95 in NA). Later, XBAND would take another stab towards the end of 1994 at creating a dial-up service aimed at both the SNES and the Genesis, testing the waters once again in providing online play options for games that ran through it with a number of options that are taken for granted today such as player profiles, leaderboards, and even an identifying avatar. Unfortunately, due to a variety of factors not the least of which was that XBAND essentially had to “hack” each game in order to facilitate actual two-player play over their 2400 baud modem and other, more immediate, issues such as the cost of long distance calls, the service was shut down in 1997. Other efforts, from an integrated modem with the Dreamcast in 1998 to an actual network port on Microsoft’s Xbox in 2001 betting on wider broadband acceptance, eventually paved the way for consoles to reach an impressive parity with PCs in the online space (at least as far as games were concerned). The Teleplay may have died before it was hatched on retail shelves everywhere, but it and many others were a sign of things to come with their spirit seen in every match-up, co-op, and deathmatch shared on networks around the world. And maybe one day, we’ll also get cross-platform play.